Re-finished concrete counter, better than original! 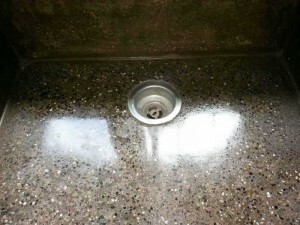 Does your concrete countertop look dull and worn out? Is the finish inconsistent, peeling or badly stained? Mend Restoration is pleased to offer on-site refinishing and sealing to bring your concrete countertop back to life. Concrete countertops were in vogue for the last ten years. During this period there have been a lot of do it yourself, home enthusiasts fabricating precast and cast in place concrete. Some of these projects looked great at first, but without proper care and maintenance, they tended to deteriorate rather quickly. The Mend team has brought over 20 concrete countertops back to life, saving thousands of dollars for homeowners on the verge of ripping them out. On average, a complete redo of your concrete countertop will cost 15 – 30% the cost of getting a new solid surface material installed. Often small areas and stains can be spot hit, without grinding or stripping the entire counter. #1 Pentrating sealer/ wax combo – This system leaves concrete looking the most natural and aesthetically pleasing, but it is susceptible to acids, oils and other chemical agents. Over time the sacrificial wax layer deteriorates in high traffic areas, the sealer wears off, and the raw concrete countertop is exposed to the elements. Dark stains and etched ring marks appear, and wear patterns generally leave the counter looking generally tired and dirty. 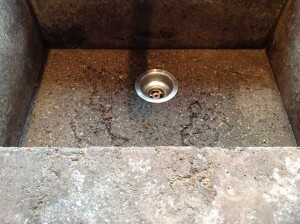 With this type of concrete countertop, small stains and areas can be spot hit without stripping the entire counter. Any chips or spalls can be colour matched and filled, likely disappearing completely. Once refinished, it is important to wax the countertop a couple times a year to prevent future problems. #2 Urethane / Epoxy sealers – These more plastic looking finishes protect against staining but are prone to bubbling, peeling and eventually fail. Once a cut or nick in the surface happens, water can get underneath and lift entire sheets of the sealer or film. With these types of sealed concrete counters, refinishing usually means grinding and or stripping the entire piece back to raw concrete. Most stains will entirely come out, usually aggregate and sand is exposed during this process. Any chips or spalls can be colour matched and filled, likely disappearing completely. Refinishing concrete counters can be tricky, back splashes can limit access, faucets and sinks can be hard to work around, and often there are hardwoods and finished surfaces in the near vicinity. The professional team at Mend will address these concerns, and build a plan that considers dust control, water recovery and cleanup after the project is complete.